"Room is the story of a five-year-old called Jack, who lives in a single room with his Ma and has never been outside. When he turns five, he starts to ask questions, and his mother reveals to him that there is a world beyond the walls." 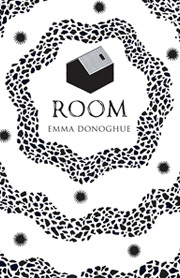 When a book is nominated for a major prize, as Emma Donoghue's Room was in 2010, it's difficult to know if they can live up to the hyperbole that comes to surround them. This can end well (as with The Shadow of the Wind) or badly (as with The Finkler Question), although this is of course all subjective. Room, however, thankfully falls into the former category for this reader. Immediately compelling thanks to the situation in which the characters find themselves, the fact that there are so few characters also adds to the novel's intensity. The star of the show is not the villainous Old Nick (we don't see enough of him for that, even though he does provide a pervasive brooding presence that is constantly in the background) or even the supportive Ma, but the five-year-old narrator named Jack, who bursts onto the page in an explosion of enthusiasm and the adorable grammatical error of a child who is still learning to speak English correctly (interested readers find on Donoghue's website that Jack's errors were inspired by those of her own five-year-old son, Finn). Jack's advanced numeracy and literacy doesn't alienate readers in any way, nor seem an unrealistic proposition: if you were cooped up in a sealed room with a small child for many years with no possibility of escape, it's not beyond the realms of possibility that you would begin teaching them to read, write, add, and multiply. And if the child has a quick mind, there's nothing to say that they would not advance quickly. However, in spite of this, Jack is still into all of the normal five-year-old boy things, which makes for a touching contrast with his clearly abnormal living situation. As readers we are so much a part of his heart and mind by the middle section that when Jack and Ma start making plans that are so big that they pose a danger to them both, our hearts begin to beat faster as we read and will it to go well for them. Donoghue increases suspense by ensuring that not all goes to plan. Naturally, this quickening pace and "human interest" nature of the storyline means that we continue to read compulsively: there is no chance of putting the book down and abandoning it for a week or more as we move on with other projects. The story ends on a high note (albeit not without several 'lows' beforehand) without proving mawkish. While there would have been mileage for the author to continue the story, she chooses not to, allowing Jack and Ma's possible future to play out in our own heads only. It is the fact that the story is cut short (although not in a way that seems too abrupt) that allows it to retain its power and stay firmly implanted in readers' minds. Presumably, this was part of what did it for the Booker Prize judges in 2010, and, it is to be hoped, part of what will do it for you too.